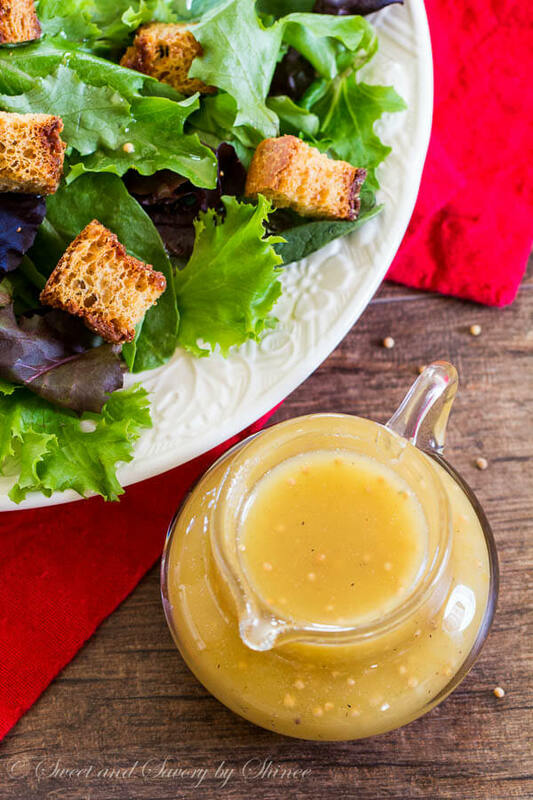 This creamy honey Dijon dressing is my new favorite. 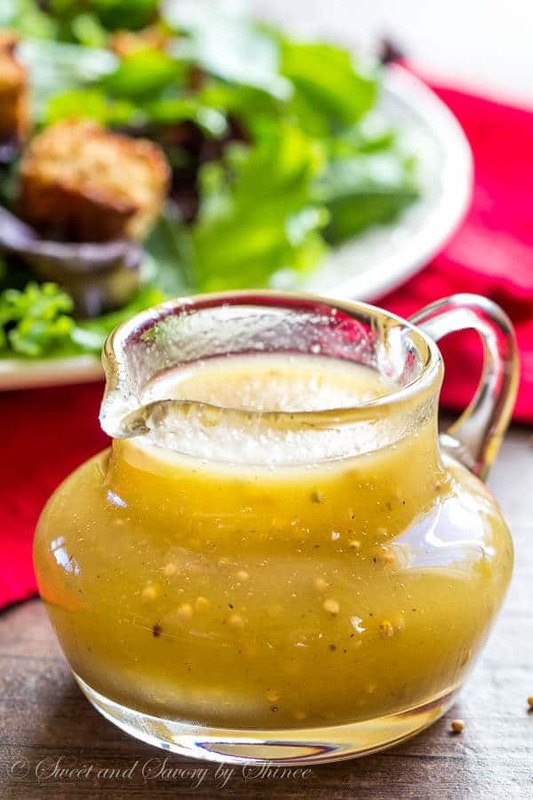 Not too sweet and not too spicy, well-balanced flavors are what makes this dressing a winner! As I’m growing a human being inside me, I’m trying not to live on just carbs (POTATOEEES!! ), sugar, chocolate, ice cream, etc. I’m actually doing my best to incorporate more greens in my diet. It’s not an easy task, you know, when your body craves all things deep-fried, bacon, cakes and cheesecakes. It’s a constant battle, I tell ya! Well anyway, I recently made my favorite salad dressing from scratch. 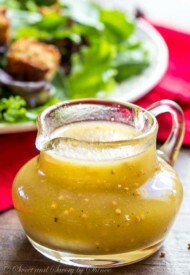 Yep, you guessed it right, honey Dijon dressing! It turned out so good that I was actually looking forward to my daily salad fix, which, of course, is usually followed by whatever sweets I’m craving at the moment. Life is all about balance, right? For this recipe, I’m using grapeseed oil instead of olive oil. Unlike olive oil, grapeseed oil is much milder in taste, which helps to highlight the Dijon mustard flavor. Raw honey is again my all-time favorite ingredient. As I mentioned here, I always specify raw honey in my recipes, because the sweetness level may vary between raw honey and processed honey. Depending on what kind of honey you have, you might need more or less of it. Taste test and go from there. Let’s talk about rice vinegar. Compared to regular white wine vinegar, rice vinegar is milder, which is why I chose it for this recipe. Again, I’m after well-balanced salad dressing here. Not overly sweet and not overly tangy. Hot question: what’s the difference between rice wine vinegar, rice vinegar, seasoned rice vinegar and rice wine? Basically, rice wine vinegar = rice vinegar. They’re the same thing. Period. Seasoned rice vinegar is rice vinegar with added sugar and salt. It’s usually used to season sushi rice. (Remember, my homemade sushi roll recipe? Yeah, that’s where we need this stuff.) And lastly, rice wine (such as Mirin) shouldn’t be used for rice wine vinegar. As the name implies, it’s wine, not vinegar. Easy, right? Now, that you’ve got all the ingredients, just shake everything in a mason jar and you’ve got yourself some tasty dressing! 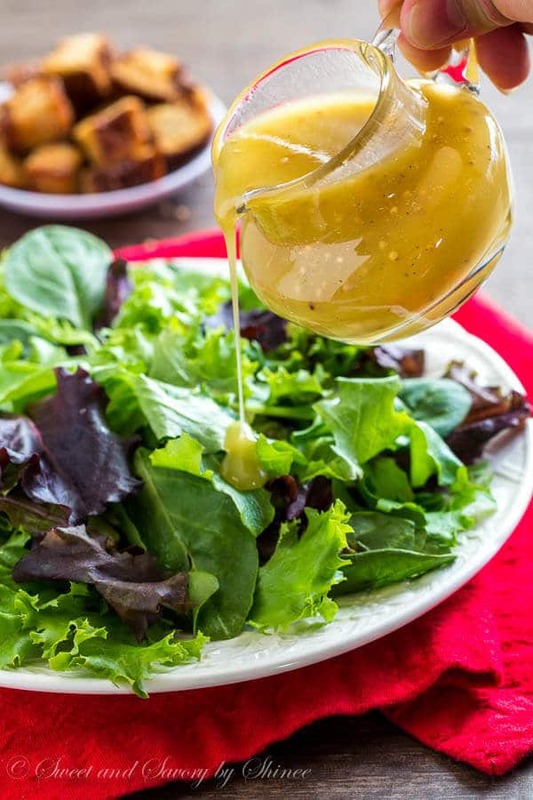 Here is to more green salads in our life with winner dressing! In a mason jar, combine all the ingredients except mustard seeds, salt and pepper. Put the lid on and shake until the mixture is well combined (aka emulsified). Stir in mustard seeds and salt and pepper to taste.